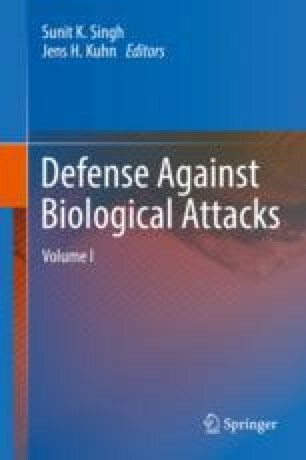 This chapter provides an overview of the scientific, policy, and operational issues involved in environmental remediation of a biological weapons attack, with a significant focus on US programs and policies. The chapter introduces the topic of biological remediation by defining the process and exploring biological agents of concern and their persistence in the environment. Past biological remediation examples are briefly discussed, followed by a review of past and current remediation policies and practices, as well as knowledge gaps and future research direction. Crystal Watson is a Senior Scholar and Assistant Professor at the Johns Hopkins Center for Health Security. Francisco J. Cruz is a Biologist with the US Environmental Protection Agency. He holds a BA in Biological Sciences from the University of Delaware and a MS in Biodefense from George Mason University. Mr. Cruz was also a 2016 Fellow in the Emerging Leaders in Biosecurity Initiative through the Center for Health Security. This work is not a product of the United States Government or the United States Environmental Protection Agency, and the author (Mr. Cruz) did not conduct this work in any governmental capacity. The views expressed are those of the authors only and do not necessarily represent those of the United States or the US EPA. US Department of Homeland Security. The Biowatch program fact sheet. 2016. https://www.dhs.gov/publication/biowatch-program-factsheet. Accessed 27 Dec 2017. US Environmental Protection Agency. ERLN overview. 2011. https://www.epa.gov/sites/production/files/documents/erln_general_fs.pdf. Accessed 27 Dec 2017. US Department of Justice. Amerithrax investigative summary. 2010. https://www.justice.gov/archive/amerithrax/docs/amx-investigative-summary.pdf. Accessed 25 Aug 2017. NIAID. NIAID emerging infectious diseases/pathogens. 2016. https://www.niaid.nih.gov/research/emerging-infectious-diseases-pathogens. Accessed 27 Dec 2017. Schonfeld Z. This is the cleaning company decontaminating the Dallas Ebola Patient’s apartment. Newsweek. 2014. http://www.newsweek.com/cleaning-company-decontaminating-dallas-ebola-patients-apartment-275208. Accessed 30 Sept 2017. Campbell A, Kaczynski A. The con artist hired to clean Ebola. BuzzFeed News. 2014. https://www.buzzfeed.com/alexcampbell/how-new-york-city-hired-a-con-artist-to-clean-up-ebola?utm_term=.ltoeXPa2bl#.wwrqnd1J6O. Accessed 30 Sept 2017. Schlegelmilch J, Carlin EP. Congress needs to act now to prevent another biodisaster like anthrax, Zika. The Hill. 2017. http://thehill.com/blogs/pundits-blog/defense/316897-congress-needs-to-act-now-to-prevent-another-biodisaster-like. Accessed 29 Sept 2017. Pacific Northwest National Laboratory (PNNL). Northwest Regional Technology Center for Homeland Security. 2017. http://nwrtc.pnnl.gov/projects/programs.stm. Accessed 29 Sept 2017. US Environmental Protection Agency (EPA). About the National Homeland Security Research Center. US Environmental Protection Agency, Office of Research and Development; 2017. https://www.epa.gov/aboutepa/about-national-homeland-security-research-center-nhsrc. Accessed 29 Sept 2017. US Environmental Protection Agency. Remediation following man-made or natural disasters – Homeland Security Research. US Environmental Protection Agency, Office of Research and Development; 2016. https://www.epa.gov/homeland-security-research/remediation-following-man-made-or-natural-disasters-homeland-security. Accessed 29 Sept 2017. US Environmental Protection Agency Region 2 (EPA Region 2). EPA Region 2 Ebola Experience. US Environmental Protection Agency Region 2; 2016. https://www.nrt.org/site/download.ashx?counter=3098. Accessed 29 Sept 2017.